Top size matters, not every base is suitable for every top due to tipping safety. The Rome H700 S Steel Disc Table Base 720mm is compatible with table tops no larger than 1200mm round in size. Rome table bases are available in four heights and different sizes, which are ideal for use as coffee, dining or dry bar heights. 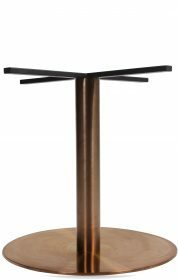 Capture the metallic look with our copper finish stainless steel Rome H700 S Steel Disc Table Base 450mm. Top size matters, not every base is suitable for every top due to tipping safety. The Rome H700 S Steel Disc Table Base 540mm is compatible with table tops no larger than 1000mm round in size. Elevate your interior with this ebony combination, it’s a statement piece for purposeful style in any dining area. Featuring stainless steel, but sporting a black chrome finish, this Toledo H700 S Steel Disc Table Base 540mm is both modern and elegant. Tivoli Disc Table Base 540mm breaks the monotony of one colour. The sturdy, steel disc base plate and steel spider will keep your table from wobbling or rocking. The Tivoli Disc Table Base 540mm is compatible with table tops no larger than 1000mm round in size. Tivoli Disc Dry Bar Table Base 540mm breaks the monotony of one colour. The sturdy, steel disc base plate and steel spider will keep your table from wobbling or rocking. 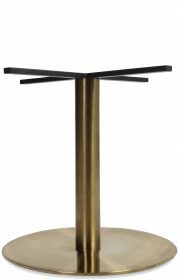 The Tivoli Disc Dry Bar Table Base 540mm is compatible with table tops no larger than 900mm square in size.